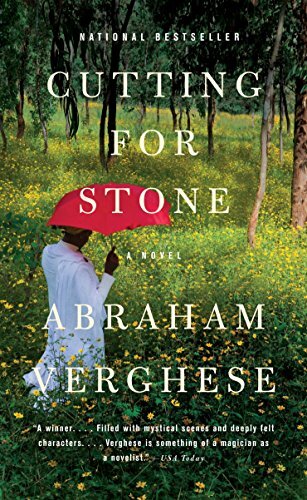 Cutting for Stone by Abraham Verghese is the tale of several lives, but in particular the narrator’s, Marion Stone, and the story of his identical twin brother, Shiva Stone. The story spans five decades and three continents. As a narrator Marion reveals himself through his relationships with those who touch his life. These characters are rich, and his relationships with them are transformative. He is sensitive to the events that shape his life and the lives of those around him without soliciting pity from his reader but rather empathy. One of the most compelling scenes in the story is the birth of Marion and Shiva. Through the eventful labor in Operating Theater 3 at Missing Hospital in Addis Ababa, Ethiopia, we meet new characters and learn more about those we already know—and how they react when they are pushed to the limits of their moral edges. There is Sister Mary Joseph Praise, a devout Nun of the Diocesean Carmelite Order of Madras (India); Dr. Thomas Stone (an Englishman of nomadic surgical disposition); and those who have a role in bringing the twins into the world: Matron Hirst, Hema, Ghosh, and the Probationer. This is the seminal scene of Cutting for Stone and sets one up for a beautifully crafted story told by a master craftsman. ShivaMarion, as Marion refers to himself and his brother, are in many ways inseparable, but their lives take very different paths. Marion is inspired by Ghosh to become a surgeon (though Ghosh did not start out as a surgeon himself); and Shiva inspires Hema, the obstetrician who brought them into the world—and the only mother they know—to try a new procedure at Missing Hospital to correct fistula in women, henceforth becoming the world authority on fistula surgery without being a surgeon himself. There is no suspension of disbelief needed here. As Mr. Verghese takes us by the hand we believe from the start and thirst for more. He provides context about Ethiopia’s political and cultural history as well as weaving in many medical procedures, ethical issues, and actual instruments, making these accessible to the reader and relevant to the story. Marion’s experience at times smashes against a paradox between the reason of the modern surgical environment around which he is raised juxtaposed with deeply held Ethiopian traditions, such as female circumcision, that he finds difficult to rationalize but doesn’t judge. There is a pivotal love triangle in the story between ShivaMarion and the girl Genet who was raised with them, culminating at the end of the story and coming full circle to the foundation of ShivaMarion’s relationship to each other: Love. Cutting for Stone illustrates that the common denominator uniting us all is our humanity, and that no political, religious, ethnic, cultural or geopolitical considerations can remove that humanity. It trumps all else. Although Cutting for Stone was published in 2010, it is a timeless tale told in an authentic voice. At the time of this book’s printing Mr. Verghese is Senior Associate Chair for the Theory and Practice of Medicine at the Stanford University School of Medicine. No slouch. He also graduated from the Iowa Writers’ Workshop, one of the most prestigious in the world with graduates and attendees such as Flannery O’Conner, Raymond Carver, T. C. Boyle, and Kurt Vonnegut. This is a book to be read for the same joy one garners from listening to Puccini’s “Madame Butterfly”—again and again. Anna Finger’s diverse writing and professional experience includes roles at the International School of Amsterdam, learning technology specialist for a pharmaceutical company, and refining her craft at the famed Writers’ Studio founded by Pulitzer Prize winner Philip Schultz.